Do you like Math Smashers? Share it with your friends. Math Smashers is an excellent logic flash game where you practice math before the end of the school year. 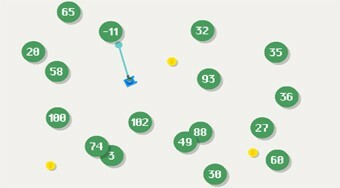 Move with the blue paddle on the board and pair the green bubbles with the numbers to get the number you want them to be displayed in the middle of the top of the screen. Once a green bubble touches you, the game ends.